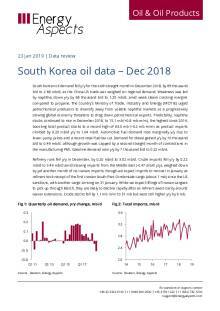 South Korean oil demand fell y/y for the sixth straight month in December 2018, by 69 thousand b/d to 2.68 mb/d, as the China-US trade war weighed on regional demand. Weakness was led by naphtha, down y/y by 68 thousand b/d to 1.25 mb/d, amid weak steam cracking margins compared to propane. The country’s Ministry of Trade, Industry and Energy (MOTIE) urged petrochemical producers to diversify away from volatile naphtha markets as a progressively slowing global economy threatens to drag down petrochemical exports. Predictably, naphtha stocks continued to rise in December 2018, to 15.1 mb (+0.8 mb m/m), the highest since 2014, boosting total product stocks to a record high of 63.0 mb (+0.2 mb m/m) as product imports climbed by 0.20 mb/d y/y to 1.04 mb/d. Automotive fuel demand rose marginally y/y due to lower pump prices and a recent retail fuel tax cut. Demand for diesel gained y/y by 10 thousand b/d to 0.49 mb/d, although growth was capped by a second straight month of contractions in the manufacturing PMI. Gasoline demand rose y/y by 7 thousand b/d to 0.22 mb/d. Refinery runs fell y/y in December, by 0.20 mb/d to 3.02 mb/d. Crude imports fell y/y by 0.22 mb/d to 3.49 mb/d amid slowing imports from the Middle East (-0.47 mb/d y/y), weighed down by yet another month of no Iranian imports, though we expect imports to recover in January as refiners took receipt of the first Iranian South Pars Condensate cargo (about 1 mb) since the US sanctions, with another cargo arriving on 31 January. While we expect liftings of Iranian cargoes to pick up through March, they are likely to decline rapidly after as refiners await clarity around waiver extensions. Crude stocks fell by 1.1 mb m/m to 51 mb but were still higher y/y by 9 mb. Users licensed for the data service can access our Europe oil data.Extract from demand:European o..
Users licensed for the data service can access our Middle East oil data. Oil demand in the 1.. Within this report you will be able to review the latest figures published by Baker Hughes by oil..
Users licensed for the data service can access our Canadian oil demand and product..
Users licensed for the data service can access our US crude balances.Extract from..